The University of Massachusetts Amherst and Payette’s design team believed it was critical to reduce the energy use in the highly technical Integrated Sciences Building. Thus, the ISB was designed to meet the requirements of the LEED Silver standard. 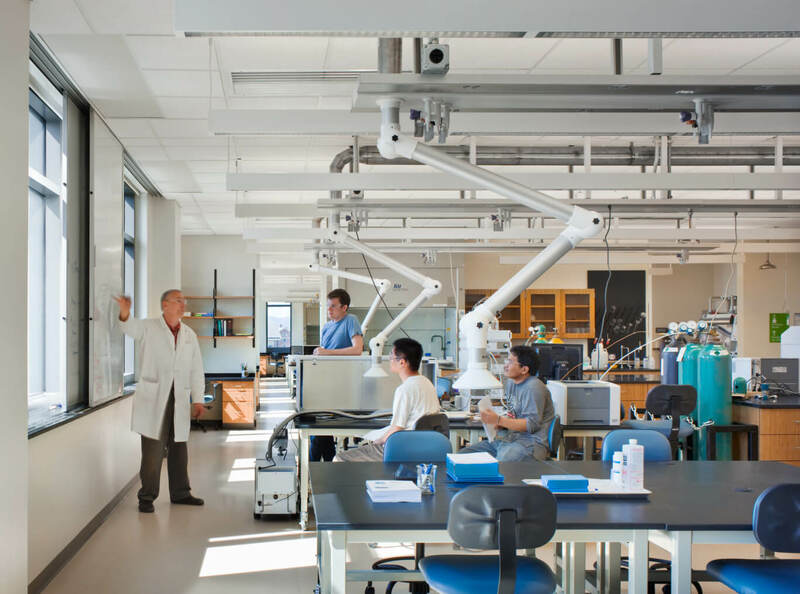 A primary sustainability goal was to reduce the energy use in this highly technical science building that houses over 150 chemical fume hoods. 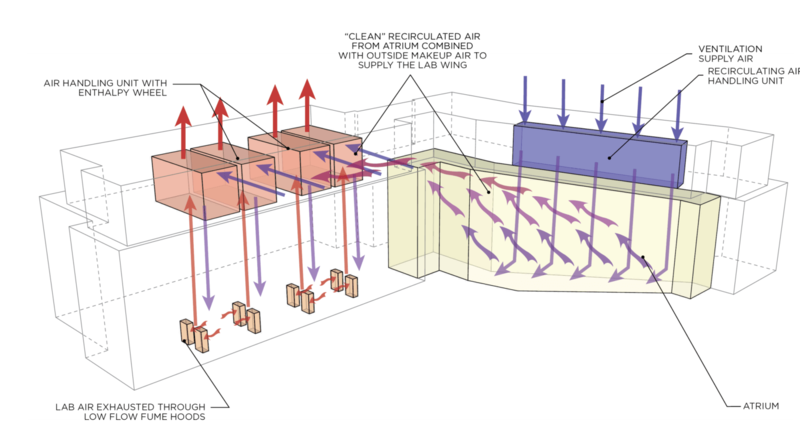 The first step was to reduce the ventilation impact through high-efficiency (low-flow) fume hoods, reduced air charge rates, and introduce an enthalpy wheel heat recovery system. The ISB is the first chemistry building to ever use enthalpy wheel technology. Other sustainable features include a high efficiency chiller plant concealed by a green roof graywater system that saves up to 250,000 gallons of water a day; a daylight harvesting that minimizes lighting energy use; and a terracotta sunscreen that reduces atrium cooling loads. Rapidly renewable and high recycled content materials such as bamboo millwork and rubber flooring highlight the building’s commitment to sustainability. These careful energy strategies all contributed to the transformation of the University’s science facilities from anonymous, isolating and inhospitable environments to welcoming, sustainable, collegial and pleasing environments for students and faculty to address today’s pressing scientific challenges.